Wilbert Robinson (June 29, 1863 – August 8, 1934), nicknamed "Uncle Robbie", was an American catcher, coach and manager in Major League Baseball. He was inducted into the Baseball Hall of Fame in 1945. Born in Bolton, Massachusetts, Robinson was a catcher in the minor New England League in 1885 and made it to the major leagues in 1886 with the Philadelphia Athletics of the American Association, where he remained until 1890. 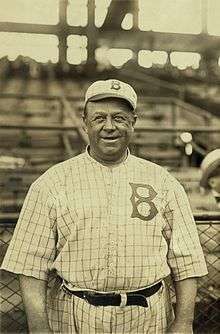 He lasted in the majors until 1902, playing much of his career with two separate Baltimore Orioles franchises – from 1890 to 1899 with the Orioles team which folded after the 1899 National League season, and in 1901–02 with the American League team which moved to New York City in 1903 and became the Yankees. He also spent one season, 1900, with the St. Louis Cardinals. While owners of a bowling, billiards and pool hall in Baltimore, Robinson and McGraw introduced the sport of duckpin bowling within the city of Baltimore in 1899. Robinson and McGraw joined as business partners in the Baltimore Orioles, a team that would debut in the new American League in 1901. McGraw served as player-manager of the AL Orioles in 1901 and the beginning of the 1902 season, at which point he departed to the New York Giants. Robinson succeeded McGraw as manager of the Orioles. After the season, McGraw enticed Robinson to be his pitching coach from 1903 to 1913, during which time the Giants won five NL pennants. In his 18 years at the helm of the Brooks, Robinson compiled a record of 1375–1341, including National League championships in 1916 and 1920 – Brooklyn's only pennants between 1901 and 1940. Those two clubs lost in the World Series to the Boston Red Sox and Cleveland Indians, respectively. His 1375 NL victories were, at the time, the 3rd-highest total in NL history, trailing only the totals of McGraw (then with 2652) and Fred Clarke (1602). Robinson was highly regarded for his ability to draw outstanding performances from his pitching staffs, a result of his many years as a catcher. Among the pitchers he guided to success were Joe McGinnity with both Orioles teams and the Giants, Rube Marquard with the Giants, and Dazzy Vance and Burleigh Grimes with the Dodgers. Another pitcher who would later recall Robinson's excellent advice, although they never played together during a regular season, was John Tener, who in the 1910s served simultaneously as NL president and Governor of Pennsylvania. On March 13, 1915, at spring training in Daytona Beach, Florida, Robinson decided to try to set a record of sorts by catching a baseball dropped from an airplane being flown 525 feet (160 m) overhead. Ruth Law, the aviator, supposedly forgot to bring a baseball and instead dropped a grapefruit, which splattered all over the manager. The grapefruit made such a mess that Robinson thought he had lost his eye because of the acid and the bloodlike splatter that covered him. He quickly realized that it was a joke when he saw his teammates burst out in laughter. Outfielder Casey Stengel, later a successful manager himself, is generally believed to have convinced Law to make the switch. From this point on Robinson referred to airplanes as fruit flies. Robinson was manager when Al López started out as a catcher in the majors. Robinson watched Lopez' style and finally hollered, "Tell that punk he got two hands to catch with! Never mind the Fancy Dan stuff." But Lopez went on to eventually surpass Robinson's record of games behind the plate. After his retirement from managing, Robinson became the president of the Atlanta Crackers minor league team. He died in Atlanta at 71 years of age following a brain hemorrhage, and was buried in the New Cathedral Cemetery in Baltimore. Robinson's brother, Fred Robinson, also played briefly in the majors, appearing in 3 games for the 1884 Cincinnati Outlaw Reds of the Union Association. Robinson was elected to the Baseball Hall of Fame in 1945 by the Old-Timers Committee.